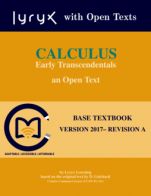 Calculus: Early Transcendentals, originally by D. Guichard, has been redesigned by the Lyryx editorial team. Substantial portions of the content, examples, and diagrams have been redeveloped, with additional contributions provided by experienced and practicing instructors. This approachable text provides a comprehensive understanding of the necessary techniques and concepts of the typical Calculus course sequence, and is suitable for the standard Calculus I, II and III courses. To practice and develop an understanding of topics, this text offers a range of problems, from routine to challenging, with selected solutions. As this is an open text, instructors and students are encouraged to interact with the textbook through annotating, revising, and reusing to your advantage. Suggestions for contributions to this growing textbook are welcome. Calculus: Early Transcendentals by David Guichard, Whitman College, Lyryx Learning Team, Jim Bailey, College of the Rockies, Mark Blenkinsop, Carleton University, Michael Cavers, University of Calgary, Gregory Hartman, Virginia Military Institute, Joseph Ling, University of Calgary is licensed under a Creative Commons Attribution-NonCommercial-ShareAlike 4.0 International License, except where otherwise noted.